For the past several decades, Bonita Bay has been a desirable destination for people to build the home of their dreams. With a large priority on preserving the area’s natural beauty, buying an existing home and rebuilding it offers an incredible opportunity to gain access into the sought-after society. The Bucy family—Karen and Bill—are the first to act on this emerging trend. Choosing to work with Harwick Homes after researching the area’s top custom homebuilders, the Bucy’s expressed their great excitement to build with a team so focused on open communication and client involvement. Under the supervision of Mark Wilkinson, a lead Harwick superintendent, the project was executed to near perfection. Located on one of Bonita Bay’s most traditional streets, Woodlake Drive, the home sits on the 18th fairway of the Marsh Golf Course and features picturesque views of the course. With approximately 3,200 square feet under air and 5,000 total square feet, the home’s highlights include a beautiful outdoor living space with a pool and a chef’s kitchen area. Inside, the home boasts a state-of-the-art kitchen amidst a spacious open floor plan with hardwood floors and customized cabinetry. The estate holds three bedrooms and three baths and exemplifies Harwick Homes’ signature attention to detail throughout. 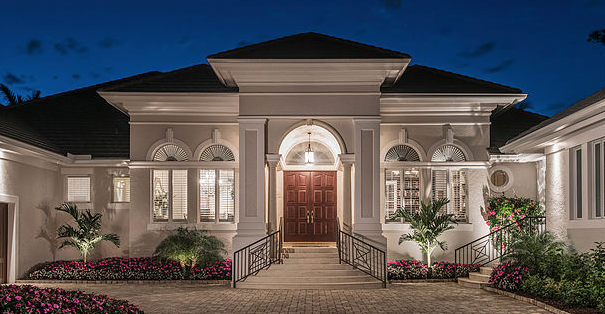 The Bucy residence was such a success, it has inspired others within Bonita Bay to use Harwick Homes for their own upcoming remodeling and building needs. Future Harwick projects in the Bonita Bay community include a new 4,000 square foot rebuild in Woodlake, which will feature a modern décor and a generous outdoor living space, complete with a fire pit and pool and will be finished next season. With so much excitement surrounding these projects, the future of both Bonita Bay and Harwick Homes has never looked better. To see more images of the Bucy Residence see our Portfolio page. Harwick Homes has been creating and remodeling beautifully inspirational homes in Southwest Florida for over 25 years. Utilizing the highest standards in technology, materials and craftsmanship, Harwick Homes specializes in working with clients to develop the ultimate strategy for success. Located at 3368 Woods Edge Circle, Unit 101 in Bonita Springs, Florida, their offices can be reached by calling (239) 498-0801 or by emailing info@HarwickHomes.com. For more information, please visit their website at www.HarwickHomes.com.